The Jesuit Missions, a wonderful place in La Chiquitania! If you have seen “The Mission” with Robert de Niro, you may have wondered how those churches look-like; well just go to La Chiquitania in Santa Cruz, Bolivia! 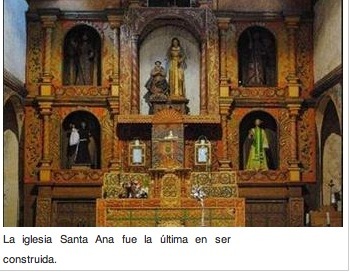 It would seem that the time stopped in the churches of the Chiquitania. Built between 1745-1772, they are the only ones out of which, it can be seen the original architecture of the Jesuit missions in Latin America, because despite the time, they still maintain their colonial charm. San Javier, Concepción, San Rafael, San José, San Miguel and Santa Ana Churches are part of this cultural heritage which, together with its villages, were declared Cultural patrimony of the humanity in 1990 by Unesco. “Two particularities of the churches of the Chiquitos are the extensive use of mural painting and sometimes mica, a mineral’s color argento of gold or silver. All of them were built with the purpose of having a good acoustics for music”, says Philipp Schauer, author of the book “Tourist attractions in the Santa Cruz Department”. The work not only illustrates the history and characteristics of the so-called “Churches of Wood Multipasillos Skeleton”, by its open structure, but which also meant the arrival of the Jesuits in this region located between the Chaco of Bolivia and the jungles of Brazil. “In Chiquitania, churches are still the center of the religious world and not only survives its architecture, but retains part of the socio-cultural heritage of the Jesuits times”, explains Schauer. It is as if the Chiquitania, of reddish land and green landscapes, had stayed with the memory of the Jesuits, who arrived to protect indigenous people from the oppression of the Spanish colony and, somehow, marked the rhythm of life and work which preserved.